Happy Movember, everyone. During the month of November, men across the country celebrate by growing out spectacular facial hair, a practice that is followed by athletes, actors and average individuals alike. Apparently, animated characters dig Movember, as well. 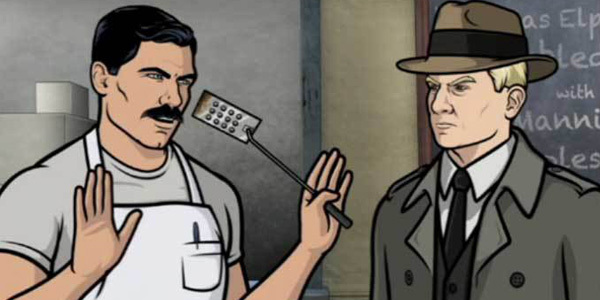 This week Sterling Archer, the spy and detective lead in Archer, announced he is growing a Movember ‘stache. The whole thing is pretty legit, with Archer taking to the Movember site to discuss supporting men’s health. Here’s what FX’s gentleman spy had to say. This won’t be the first time Archer has had a big facial hair change. In fact, we’ve seen him with a pretty solid mustache before, during the Season 4 opener. During the episode, Archer was lying low and going under the alias Bob Belcher, which is a nod to Fox’s animated comedy Bob’s Burgers. Archer was unfortunately suffering from amnesia following his mother’s wedding and had no idea what he was doing working in the burger joint. Amnesia may have had an effect on his facial hair, but not on his spy skills. Unfortunately, Archer isn’t on the air right now, so we won’t be able to check the progress of Sterling Archer’s mustache on FX. If luck is on our side, however, our main man will drop a picture on Facebook or the Movember site or somewhere else to let us see the beautiful representation of manliness get bushier and bushier as November powers forward. After all, the men of the world need a pick-me-up after longtime mustache hero Alex Trebek lost a fan poll and was forced to get rid of his luxurious man hair. Exactly which Communists voted against him keeping the facial hair is unclear, but it’s reasonable to think those people hate men’s health and are probably unhappy. Archer is expected to return to the schedule for Season 6 in January of 2015, although the ISIS name will be dropped in the new season. As for whether or not Sterling Archer will have a moustache at that point, we’ll just have to cross our fingers and hope.